10/6/2016 Updated Progress Bar! I decided to provide a more accurate illustration of where we stand in the production process of the novel works. I've been very, very hard at work this past year really hammering out the 1st novel and refining it. I'll be posting Act 1 up here for everyone to enjoy! So check out the updates as they come. Welcome to the Ahn'Dia Project Patreon! What is the Ahn'Dia Project? A series of rapid-release novels set in a fictional world that has been painstakingly built over the past several years. Tired of investing into fantasy novels that take forever to be released and drone on endlessly before a conclusion? You’re not alone. The Ahn’Dia Project promises a series of books set within the same world and that have been thoroughly plotted well in advance of their writing. The goal is to create multiple arcs which may span several books but quickly reach a meaningful conclusion. The World of Ahn’Dia is huge and dynamic. Within it are countless stories and characters to explore. This Patreon was erected to help fund the lengthy production of these books. Creating dozens upon dozens of plot threads, characters, and backstories takes a very long time. But the Patreon is moving quickly and the difficult part of the production is almost complete. So please, join us and become a Patron. All of our Patrons receive an in-depth Newsletter providing details on how the Ahn’Dia Project is progressing. Feel free to view our first newsletter to see what you’ll get each month in your inbox. For the past several years, I have been producing my novel series. These works of literary fiction have been a permanent part of my life. I have put great effort into seeing them completed. But the production process is not necessarily easy, nor is it very cost effective. Works of personal fiction do not merit much income until they have reached a publisher and even then, it takes months for a book to make it to the bookshelves. In due time, my novels will be submitted to a crowd funding website called Inkshare, which will allow individuals to purchase the final book before it is printed in order to pay for its printing and distribution costs. However, before a book can make it to that stage, it must first be written and the characters must be fully fleshed out and understood. Works of epic fiction go through numerous stages of growth and development: Conception, Analyzation, World Building, Character Study, Writing, Editing and finally, Printing, before it can reach the hands of its audience. At present, I have reached the Character Study stage after three long years of World Building. Sadly, the funds I have set aside to help me pay for this book’s production are running low; so low in fact that I have opened a campaign in which patrons can support me and help me finish the final stages of my book. This is where the service Patreon comes into play. 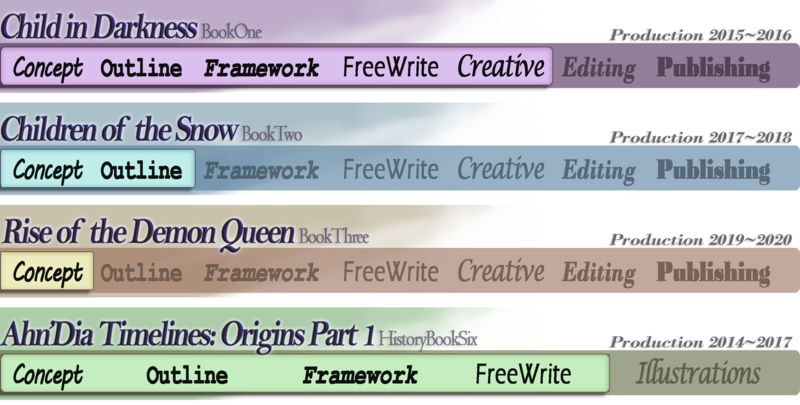 In essence, you will be subscribing to the project, paying as little as $1 a month to help the Novels grow and succeed. In return for your patronage, you will receive a monthly newsletter updating you on the progress of the novels, along with various tips and updates in the affairs of modern computers simplified for easy reading. Generosity is yours alone to offer. There is no reason not to say no, but I would not think any less of you for declining this invite. My purpose here is to make you aware of one of my passion projects and allowing you an opportunity to help in its growth. If you have any ideas on how I can further reward you for your potential patronage, please let me know. I will be more than happy to discuss various options to compensate you in anyway that I can. Since I was 14-years-old, I have been dreaming of a particular idea. Since then, many stories have been flowing through my head — all of which centered upon a handful of common characters that have grown with me throughout the years. The story I have always wanted to tell has gone through several evolutionary changes and developed as I matured and became more world aware. In 2009, I took a stab at writing the novel for the first time. The novel was completed and another novel quickly followed it. But to my dismay, I realized that the writing was subpar, and the overall message was lost to the reader. I needed to go back to the drawing board once again. Most people do not write that first novel they keep promising themselves they will. I have already written two novels and analyzed where the errors were. I have devised a way to fix my errors and make the story have true and meaningful impact for the reader. In 2012, I began production on the world in which the novels would be set. I have written six full length history books that outline in depth the cultures, peoples, places and things which make up the universe I created in these stories. This vast undertaking took far longer that I originally planned. But the work has been worth it and the series continues to grow. The World Building is complete. Now I am at the final stage before the deepest and most meaningful writing can begin, the Character Study. My latest book goes into extreme detail; analyzing each character that will play a major role in the story — excluding only the main character, Samina. The novel series is about exploring Samina’s mind and character development, allowing the reader to experience her journey and growth: ultimately becoming invested in her success. The current work studies characters featured in the novel that will not be given the same treatment as Samina. As supporting characters they will not be so closely examined, allowing the story to read more fluidly without overbearing exposition. Once the Character Study is complete, full production on the re-write of the first novel will begin. My test readers have assured me that the changes I have made thus far have made the work profoundly enjoyable. They demand more. Using Patreon will allow me to focus extra time and effort to the project so that it can be completed sooner. The World of Ahn’Dia is more than just a pet project. It is my legacy and my life’s work. Everything I have done, everything I am, everything I ever will be has been invested into the growth and success of these series of books. But know this, it is not because I yearn for success — it is because I yearn to tell a story, a story I feel must be shared. Stories are meant to be shared. I want the audience to believe the characters I have created are truly real. This is why I have put so much work into crafting and shaping the World of Ahn'Dia; for it is the world that shapes the characters, not the characters which shape the world. I also do not like bland dialogue and pointless exposition, or the combination of the two. By building this world from the ground up, I have provided myself with the tools to craft realistic characters, personalities and conversations. Within the pages of my work resides a deep and meaningful message. Through this message, I wish to relay my own life experience and what I have learned to those who would follow me. I wish to touch their minds and change their life. I cannot do this without your help and patronage. Why are Student Loans important to me? Well they are preventing me from enjoying a fluid work schedule. With your support I can produce more work.